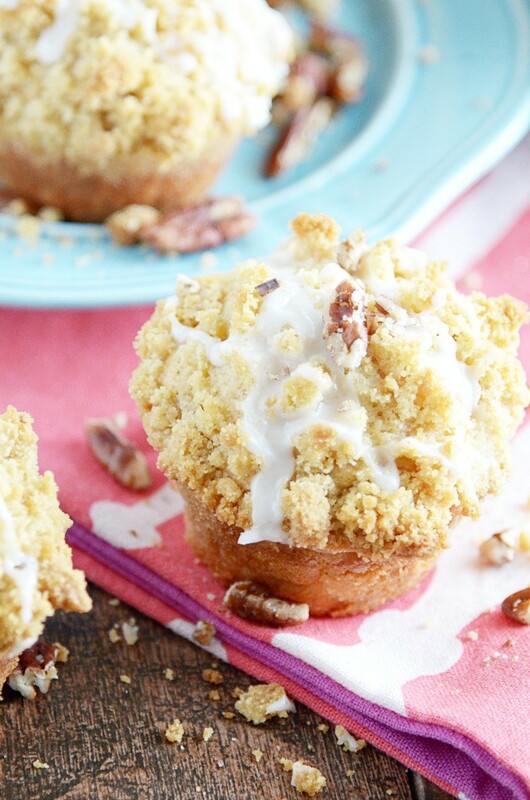 Big buttermilk cinnamon muffins topped with an extra helping of buttery streusel topping and a sweet glaze. 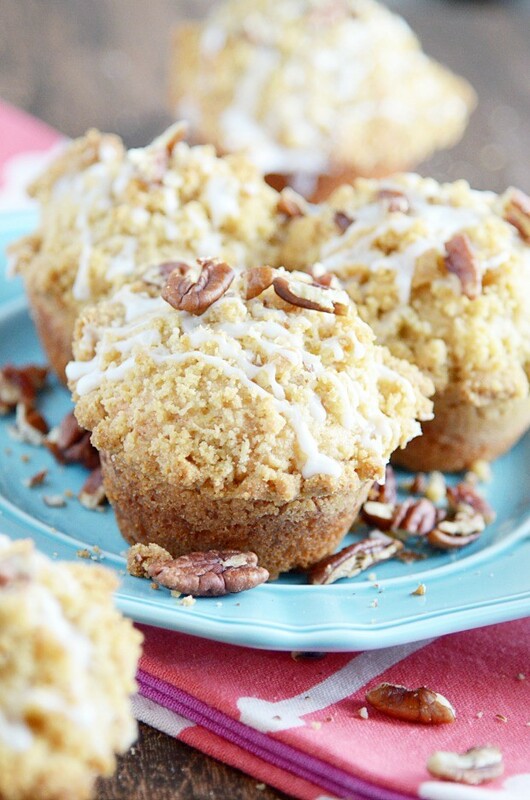 These giant, cinnamon-y, crumbly muffins might be a touch out of place among all the healthy recipes, and football food, and Valentine’s day treats that are so popular this time of year. But oh well. 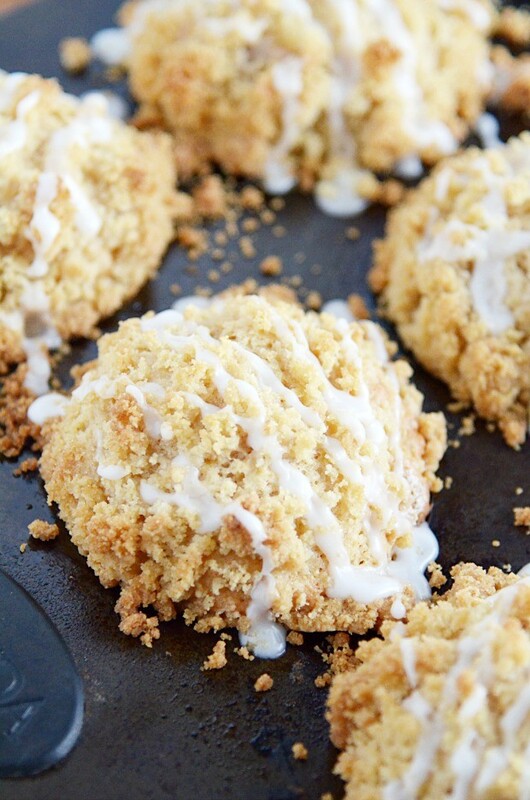 Those big heaps of crumbly goodness drizzled with vanilla glaze just make my heart go pitter patter ???? no matter the season! Last weekend, Emma was dying for some muffins. Chris voted for Apple Cinnamon, but Emma doesn’t do chunks of anything in her food. So we compromised, and I turned half of the batter into Salted Caramel Apple Muffins (those will make an appearance here soon!) 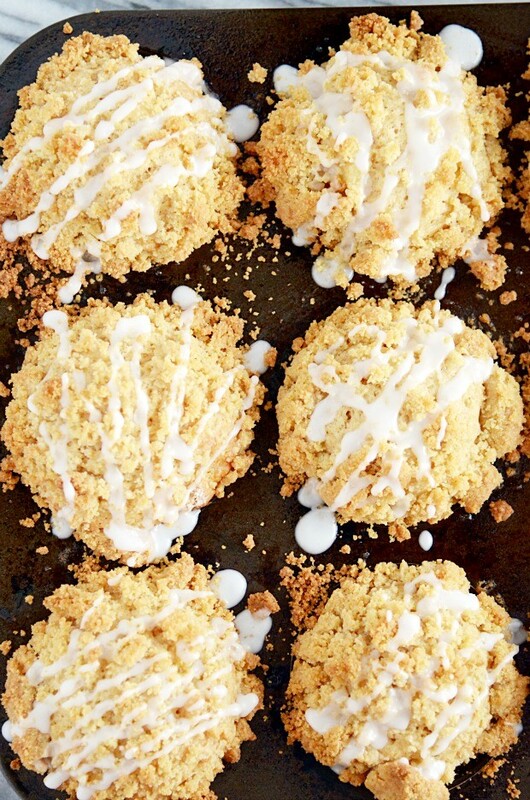 and the other half became these Buttermilk Cinnamon Crumble Muffins. You guys. 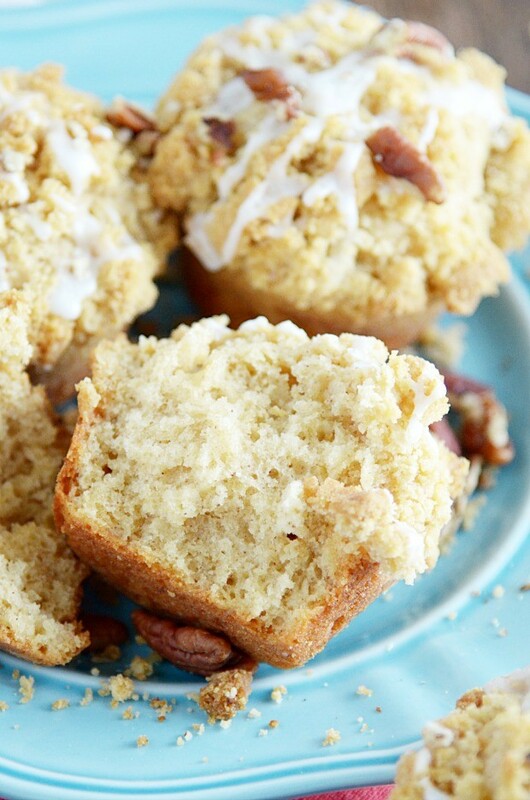 These muffins just can’t be beat. They are that good. I veered away from the muffin recipe I’ve used frequently in the past, because I knew wanted something that would be a little bigger and fluffier. I also knew that I needed to use buttermilk, because I wanted a muffin that would be mouthwateringly soft and tender. Like yogurt and sour cream, buttermilk is an acidic ingredient. So it helps to tenderize the gluten in the mixture, which yields a softer bread. If you don’t have buttermilk on hand, you could use regular milk and sub half of it with sour cream or plain greek yogurt to make the center of your muffins unbelievably soft and fluffy. Also, let’s talk about this crumble. It is my everything. Butter, sugar, cinnamon all piled on top of a fluffy muffin. Heaven, I tell you. And this recipe calls for a DOUBLE BATCH so that each and every muffin gets a ginormous hefty layer on top. 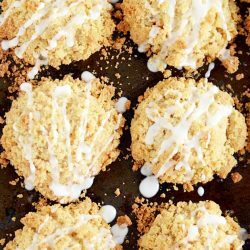 I spooned about 2 tablespoons of the crumb topping on each one. The sweet glaze on top is technically optional. But it’s so easy that I don’t see why anyone would want to go without. Just a little powdered sugar, milk, and a whisk. And you’ll feel like you’re eating a cinnamon roll/muffin/donut hybrid. Which is obviously ideal. ???? DO NOT OVERMIX THE BATTER! This is SO important. Just mix until a batter forms. It won’t be smooth, and you may even still have a few (small) pockets of flour visible. That’s okay. To keep these muffins soft and tender, it is crucial that the batter not be overmixed. The best way to avoid doing this is to follow the directions exactly, mixing together the dry and the wet ingredients separately before combining. Optional: chopped pecans for topping. Preheat oven to 425ºF. Grease two standard muffin tins. Mix together the flour, baking powder, salt, and cinnamon. Set aside. Whisk together the wet ingredients and the sugars: eggs, granulated sugar, brown sugar, buttermilk, oil, and vanilla. Gently fold the wet mixture into the dry until a lumpy batter forms, careful not to overmix. Scoop about 1/4 cup of batter into each of the muffin tin cups. Make the crumble: use a fork to whisk together the brown sugar, cinnamon, and flour. Smush in the softened butter until fully incorporated and crumbs form. Use your hands to "smush" together the smaller crumbs to make larger crumbs. Spoon 2 tablespoons of the crumble over each cup of muffin batter. Bake for 5 minutes at 425ºF. Then reduce heat to 350ºF, and continue to bake for 15 minutes. Whisk together the powdered sugar and milk to for the glaze and drizzle over each muffin. If desired, sprinkle with chopped pecans.